INCREDIBLE way the Yoreme have of teaching their youth the importance of tradition and community! Enjoy this centuries-old tradition and its mix of pre-Hispanic, Catholic and modern influences. 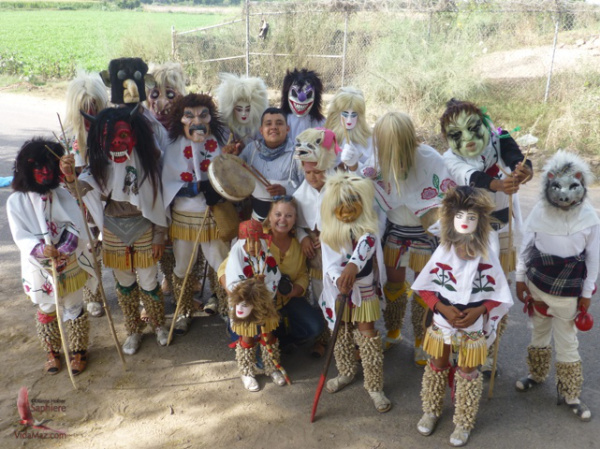 Some of the Judíos en route to Mochicahui, with yours truly in the center. I am passionate about culture. My friends, family and professional colleagues know that. I hate to see a language or a cultural tradition die out. I feel sure in my bones that when we lose such a treasure, we lose some of the answer—some of the solution—to living together in a sustainable and harmonious way on our planet. That being said, this weekend we witnessed one of the most wonderful rescues of cultural tradition that I have seen in a looooong time—the return of EL KONTI to the corrida of Las Higueras in the small Yoreme town of Mochicahui! This entry was posted in Links and reposts and tagged Cultural Detective, dance, Easter, First Nations, indigenous people, multicultural society, native people, passing down traditions, tradition by Dianne Hofner Saphiere. Bookmark the permalink.